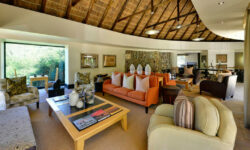 The Eagles Crag Lodge has 9 detached suites can sleep a maximum of 2 adults per suite. 7 King bedded Junior Suites and 2 Twin bedded Junior Suites. Tucked away and surrounded by imposing mountain cliffs, expresses an elegant ambience amid nature’s beauty. 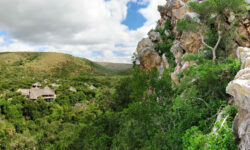 Exclusive suites fashioned in African thatch, glass and stone offer guests expansive views of the surrounding rock faces; where the eagles soar. Each suite is a secluded haven in which to unwind in sheer comfort. The Lodge has a library/ board room which accommodated 18 delegates, Bar/ Cigar lounge featuring a replace and big screen TV with glass fold-away walls opening out onto the deck. 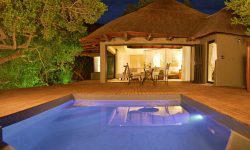 Suites are air conditioned, with tea and coffee making facilities, hair dryer, safe, International adapters, mini bars, fans and plunge pools.